“Masuri” is a character in Magic Kid Masuri, a kids’ drama, which was a sensation for children in the year of 2002. The main actor, Oh Seung-yun, has actively continued his career in the show business for over 20 years. He currently appears in musicals, dramas, and movies. 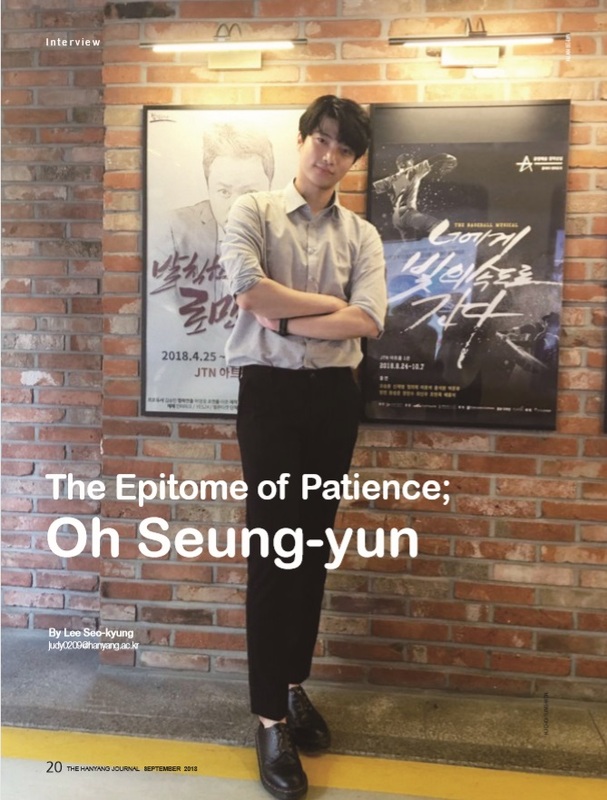 The Hanyang Journal met Oh Seung-yun, who revealed his stories about the hardships he has faced, what his anticipations are for the future, and his new upcoming challenges. Q. Were there any specific reasons as to why you decided to be a child actor? A. My mom used to work when I was young, so she had to send me to a nursery. I was timid and shy, which gave her a hard time leaving me at the nursery everyday. At first, she thought of sending me to a speech class so that I could communicate with different people and develop social skills. Unfortunately, speech classes were very expensive. Later, she found out about acting classes that were cheaper and had many students per class where I would be able to actively communicate. While taking the class, I got a chance to audition for a role in Chaban-go-deung-o and I got the role. That was the start of my career as a child actor. At first, my mom did not want me to pursue acting as a career because she was worried that I would not be able to keep up with my schoolwork, but after persuading her, she slowly started to come around. Q. You have been working in the same field for over 20 years now. Is there any specific reason that you have chosen to do so? A. Surprisingly enough, despite her initial reaction, my mom was the one who kept me going. She told me that I should be grateful for the chances that the producers gave me and for that reason, I said yes to every opportunity I had. The only time I had to stop for a brief period of time was when I got older in high school, so that I could focus on my studies. Q. I am sure that there have been difficult times for you as an actor. How did you overcome the hardships when they arose? A. I could overcome them thanks to the people around me. I usually face hardships because of people that deceive me, and I find a way to overcome it through those around me such as friends, managers, writers, and my family who provide me with a way to endure the difficult times. 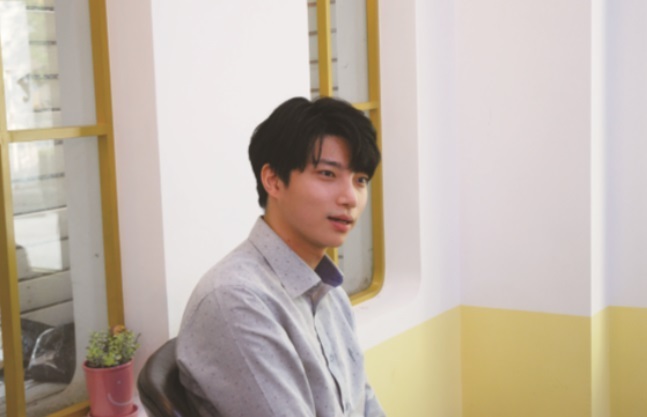 Q. You’ve taken on various roles in dramas, movies, musicals, and even as a dubbing artist. What do you think suits you the most, and why? A. I don’t think I can pick a genre that suits me the most, because they are all very different. Dubbing is fun because it is one dimensional, unlike other fields. In musicals, I can actively communicate with the audience; and dramas and movies allow me to really act in a way that I want to pursue. Every genre has a different energy and is fun, which is the main reason why I want to continue doing everything I can. Q. What was the biggest difference you noticed when you were shooting for the web drama Han ban-jang, in which you had a role as a detective? A. The character I played is very smart, cool, cynical, and serious. And even though he is young, he has a lot of people that he has to control. I am used to doing a lot of ad-libs and impromptu acting, but for this drama, I couldn’t at all. Q. You appeared as the “Byungpoong man” in MBC’s show Bokmyun ga-wang, and surprised many viewers with your great singing skills. Did you always liked singing and used to practice? A. Yes, I’ve always enjoyed singing and listening to music. I often listen to K-pop and trendy songs. The opportunity came to me as a surprise, too. When they first offered me to make an appearance, I couldn’t accept it because I had a problem with the manager and the company I worked in at that time. I wanted to give everything up, so I denied their offer. Several weeks later, after things had settled, they contacted me again and that’s when I finally said yes. Q. I think that many readers who are in their twenties now remember you as “Masuri” in Magic Kid Masuri, which many people deem as a major piece of work when you were a child actor. What do you think are the advantages and disadvantages of working or acting since you were young? A. Some pros would be that I am able to pick up the air around me very well, as I am used to working with older people since I was young. However, I get stressed easily, and cannot act in an immature way. Nowadays, I try to be as immature as possible in order to act in a natural way. Q. The first baseball musical in Korea, Speeding to You in the Speed of Light has just started, which is an unfamiliar subject to be made as a musical. Were there a lot of difficulties while preparing for it? How was the preparation stage of the musical? Also, can you please briefly introduce your musical to the readers? A. The musical is about baseball players, Lee Seung-yuop and Kim Keon-deok. It deals with their dreams, successes, and the people around them, basically making it an autobiography of the players. The main topic of the musical is baseball. However it does not require any knowledge about baseball, as it does not deal with the sport itself. I am constantly practicing the postures and meeting with the players themselves to listen about their life stories in detail. Q. You started directing short movies and writing scripts. Are there any specific reasons as to why you gained interest while directing? Also, do you have any specific plans regarding it? A. I wanted to develop my acting skills by looking at myself from the perspective of a director. By doing this, I was able to learn that actors looked livelier and more comfortable if they act in a certain way, and thus it helped me improve my acting abilities. In the process of shooting short films and writing scenarios, I learned that there are no lines or scenes that are useless; everything is there for a reason. I do not have any plans regarding directing at the moment. It is just so hard, and I don’t think I can dare to do it for long. Q. Do you have any other fields that you are interested in, other than the entertainment industry? A. I started learning DJ-ing. It is so much fun, and I think it suits me very well. As an actor, I am always another person. I speak and act in a way that those characters would specifically act. However, through DJ-ing, I found a way to express my true self. Actually, the writers of Bok-myun ga-wang introduced me to DJ-ing. I have been learning it for almost three months, but now I’m currently taking a break since I have to concentrate on the musical. Q. Which character is the most memorable to you, and do you have any other roles that you would want to play in the future? A. The most memorable character for me would be the villain I played in the movie Grandfather. I could feel a weird delight while playing it even when the character was very dark. A role I would like to take is being a man-like character in a noir, because it would make me look manly. I want to try being a character who is super masculine. Q. Since you have been working in the same field for a very long time, do you have any advice for people in their twenties who give up on their dreams because of burdens such as the lack of time? A. I don’t know about advice, because I too have thought about giving up on my dreams multiple times. I think you really have to find what your dream truly is. Are you dreaming for your own happiness, or do you have that dream because you want to be better than others? I constantly used to compare myself to others, but now I have changed and found a dream that makes me truly happy. During that process, I have made a lot of good relationships with the people around me. Q. Looking back on your 20 years of your acting career, what do you think is your greatest accomplishment, and what is the thing that you feel the most sorry about? A. My greatest effort is that I have become the person who is always thankful for the people around me. I have changed a lot in my twenties, and through that period, I learnt a lot about the importance of people. The thing I feel sorry for is that I rejected every offer that I received for becoming an idol singer. It could have been fun if I at least gave it a try, but back then I only wanted to pursue acting. Q. Do you have any plans or desires for your future career? A. I wish I could continue acting in every genre possible. That is my main goal and plan for now.